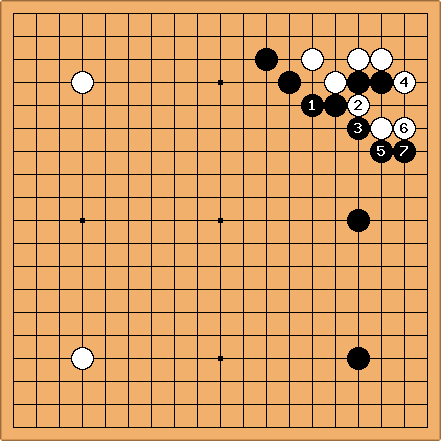 It is fairly customary for Black to use the one-space pincer against a white approach to a 4-4 stone, in the sanrensei formation. Normally, White will enter the corner. and Black will gain major influence. If one doesn't like this result, one can think about playing as a double kakari instead. They say that this is good for White, however, presumably because the stone is oddly placed. Both a and b are seen in professional play these days. SnotNose: I recall seeing this as a possible continuation (I may have a move or two wrong). I think I saw it in Making Good Shape by Bozulich. The idea is to sacrifice the two black stones in the corner so as to build a wall on the outside. 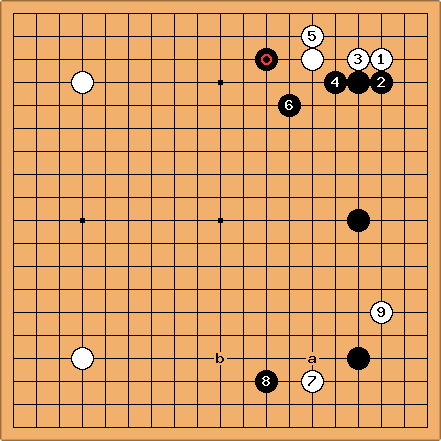 There may be circumstances where this is appropriate, rather than making the bad shape of the previous diagram and leaving bad aji for White to mess with inside Black's moyo. However, this is a large corner for White. Maybe in the book the context was slighly different. 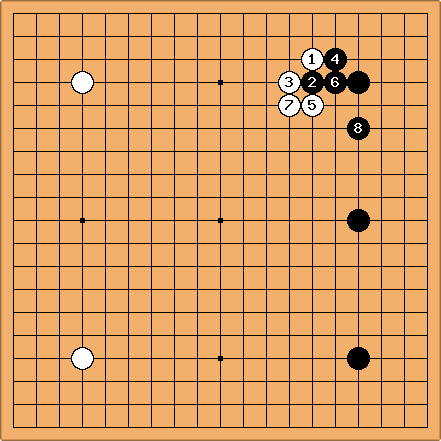 It is wrong for Black to attach against the second kakari stone as shown. On top of that, White has the cut at a and the aji at 'b' to look forward to. Jiang and Rui state that is the strongest reply. (I recall similar advice from Segoe, in his Strategy Dictionary.) White can continue at a, b, or , but they do not see any really satisfactory continuation for White. In particular, the immediate leads to a difficult fight for White. Just as a sidenote to this variation, black has a HUGE endgame concerning this position but should not be played inmediately as it removes the aji of the two stones. SnotNose: This is okay but Black and White should be aware of the weaknesses in the shapes. When appropriate, White can cut through the knights moves of , , . 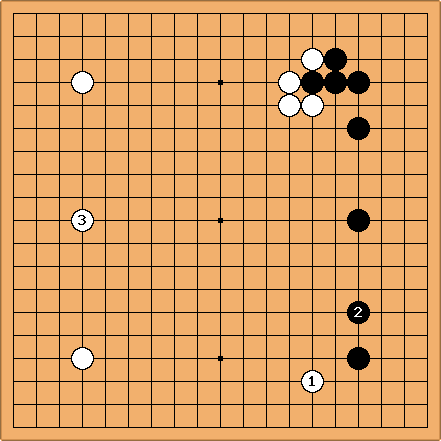 Also, if White gets sealed in on the top, Black can start a ko with a move at a (continuation is double hane). This can be a risky ko for Black because if White wins, the moyo on the right can get drastically reduced. 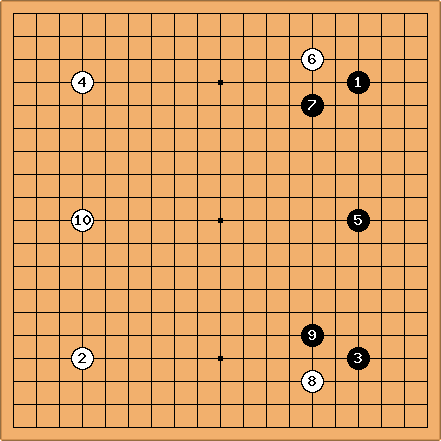 To prevent the ko possibility, sometimes White plays a before or plays one point below a very soon after this sequence. NormanP: It took me a while to find the ko sequence even after I knew it started with double hane. Here it is, I think. Please correct me if I'm wrong. My first try was to play 5 at A, but that allows white to live by capturing and then filling. 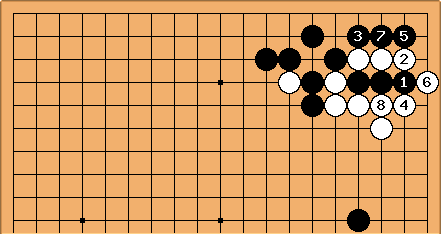 It seems to me that if white has support for an invasion of the moyo on the right side, he might want to extend from 4 on move 6, sacrificing the corner to invade the moyo instead. Also, note that white has two internal ko threats, at s15 and s19, so if I understand correctly, black would need at least two more large ko threats than white to consider starting this ko. Krit This line seems fine and the next popular move is white 7, if black pincers again, going into corner and gives black another wall seems bad to me. Therefore, I would counter it with another kakari at 9. But recently I was attached with black 'a' at move 8 by a 2 dan which was something I didn't expect. Even though I did a hane outward and got a stable group at the bottom I did not get enough points. It would be good to know what higher dan think of black 'a' and how white should play it. Because of that incidence, now I take a softer approach as white by playing white B at move 7, with a slightly >50% success rate. Krit White 7 gives some influence and also increases the possibility of invasion later? AJP: Is this acceptable for white? Any ideas for white follow-ups here? Lynx If I were handed this position, I would want to kakari on the bottom with a knight's approach, then, if the response was to play on the top, make a sanrensei. This assumes submissive play. The problem is that although I want to make the sanrensei, I also can't stand to let B make the kakari on the bottom. As such, I wouldn't be happy with this position. fractic: I'm only 12k but this looks like inconsistent black play to me. Black plays an influence based sanrensei but then chooses a territorial joseki giving white influence to counter the sanrensei. I would just approach the lower right stone. If black doesn't pincer he would have played all his stones on the right side. Another variant that I've seen in pro play is, not the kosumi response, which is a highly personal and involved joseki (in that it's quite complex and only a few players seem to like it), but rather the one space jump to the side. While I personally agree that B is being compressed, apparantly B can do so and still win. Dieter: Yes, but in my view Black is not compressed at all here. He can on the contrary press White down on the points a and develop towards the center, or invade at the points b and take positions on top and bottom. 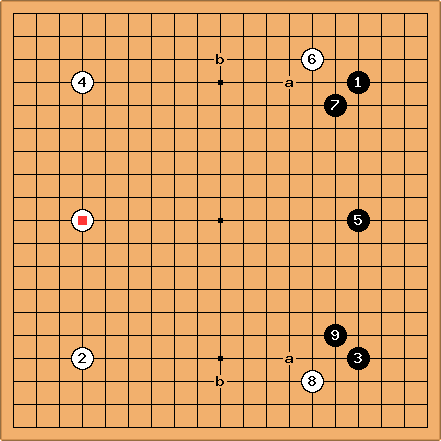 The reason why, IMO, the diagonal moves of and are not so popular is that the sanrensei in itself already enables the active invasions b and these diagonal moves are difficult to be used in an efficient manner. 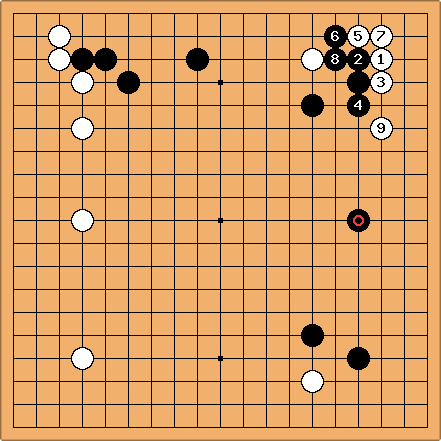 Bill: Go Seigen likes the capping play, . 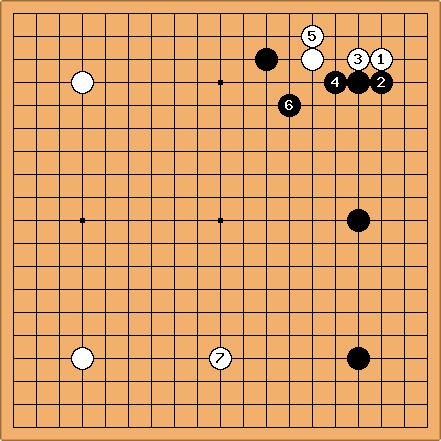 In Go Seigen: 21st Century Go, vol. 5, he devotes some lectures to this pattern. 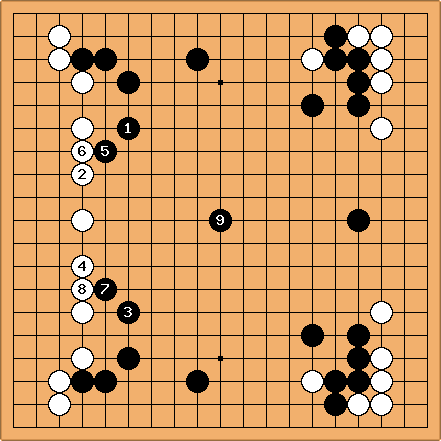 Bill: Go Seigen recommends the high approach, , to avoid a pincer. Note the closeness of , to avoid weakness in that group. 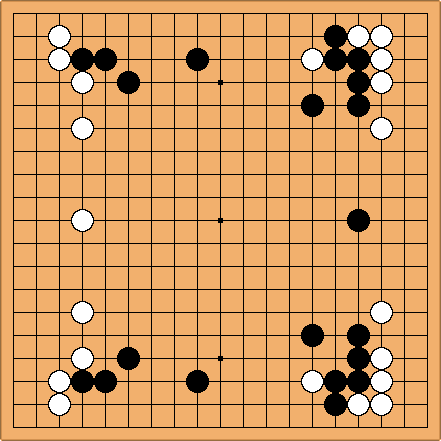 Bill: Black extends to to avoid overconcentration with and to take sente. Bill: In this example the same thing happens on the bottom side. Bill: Now Black stakes out a huge center. If White ignores or Black invades the left side. 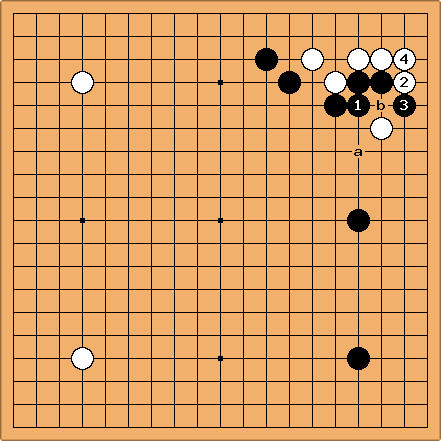 Go Seigen reckons that Black is ahead by about 20 points on the board. 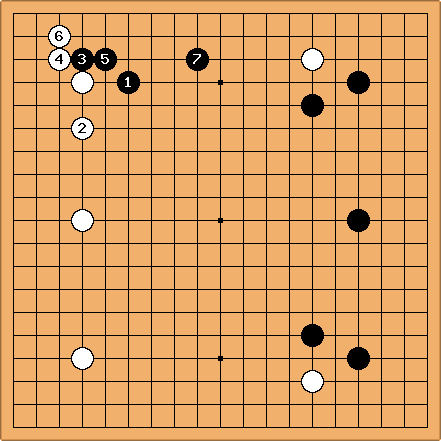 OC, Black is giving komi and White has sente, so Black's lead is really around 5 - 10 points.